Displaying goods and using advertising signs on footways and pedestrian areas all add to the colour and atmosphere to every day life and can enhance the environment within which we live and work. 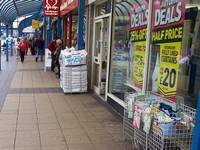 However, they can also interfere with public passage along a pavement and cause a hazard particularly for disabled and visually impaired people. Conditions for the placement of displays and advertising boards on the Highway. The Council wishes to control the placing of items on footways and pedestrianised areas in a fair and consistent manner, recognizing the potential conflict between pedestrians and traders, but always putting first the safety and amenity of pedestrians. The following guidelines are contained in the policy for dealing with obstructions on the footways. A business must have a public liability insurance of at least £2 million to safeguard against a claim from the public, have due respect for the health and safety of the public and demonstrate good housekeeping. The display of goods on the footways are at the discretion of the authority and should not extend more than 1 metre off the shop frontage and be contained within the width of the shop. Displayed goods must have a suitable barrier at its ends to provide clear demarcation. There must be a clear width of passage on the footway for pedestrians of 2 metres. Items on the footway must be placed in such a manner that pedestrians are not forced onto the road directly or because of the number of pedestrians. The visibility of motorists or pedestrians is not interfered with. In pedestrian areas there is free passage for the public and a minimum width of 4 metres for emergency vehicles. There is no permit or licence agreement for the placement of displays and advertising boards on the Highway. However the placing of signs or advertising boards on the footways are at the discretion of the authority. Letters of interest should be sent to the streetworks department; or you can contact us direct to discuss your proposals. Further information is available in the leaflets provided below. There is currently no charge for approval for the placement of displays and advertising boards on the highway. Applications are typically processed within 28 days. Yes. This means that you will be able to act as though your application is granted if you have not heard from the local authority within 28 days of receiving a fully completed application.